Leaving your garden in a perfect state has never been easier thanks to the RYOBI 18V ONE+ 4.0Ah Blower & Line Trimmer Combo Kit. The included line trimmer has a 1.6mm auto-feed head fitted, providing both easy line delivery and impressive performance. The head can also be adjusted, so you can go from general trimming to edging in the blink of an eye. At only 3kg, using the RYOBI ONE+ line trimmer couldn’t be simpler. And to give your garden the ideal finish, the ONE+ blower can remove all loose leaves and debris. With 190km/h blowing speeds, you can bring your paths, driveways or workshop back to picture-perfect. To make working easy, the entire blower weighs only 1.9kg – far less than petrol equivalents. 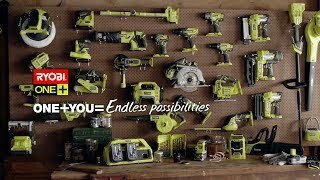 With an included 4.0Ah battery and 2.0A charger, the RYOBI 18V ONE+ 4.0Ah Blower & Line Trimmer Combo Kit makes maintaining the perfect garden a piece of cake. Grab your RYOBI 18V ONE+ 4.0Ah Blower & Line Trimmer Combo Kit from your local Bunnings Warehouse today.